Foot Levelers Pillo-Pedic Neck Pillow from HealthyKin.com is recommended by chiropractors nationwide for people with neck pain. The Pillo-Pedic Pillow provides gentle neck traction while you sleep, helping to promote correct neck alignment and maintain cervical spine support. Pillo-Pedic's patented four-way design includes a specially constructed edge for added support, and a flat profile which helps eliminate pillow roll away. Designed for both side or back sleeping positions, the Pillo-Pedic helps pillow users wake well rested and refreshed after a great night's sleep! 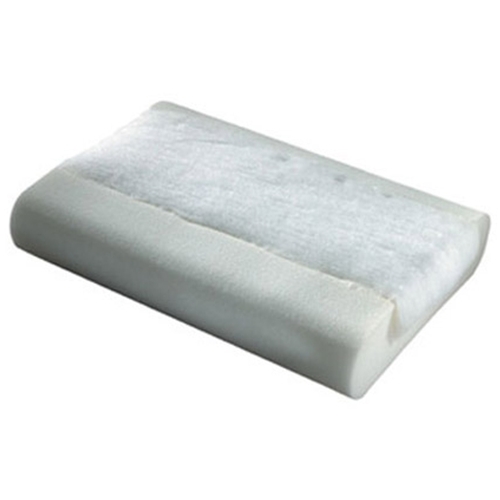 This chiropractic pillow also helps to relieve whiplash, neck and shoulder discomfort and tension headaches. Extra: for large framed adults who are over 180 lbs; 23"L x 15½"W x 5½H"
I continue to buy this product after the pillow needs to be replaced. It has been a great help in relieving neck and back pain. I cannot sleep on any other pillow. The pillow allows me to rest comfortably without waking with headaches or sore neck and shoulders. I am a small person and purchased the junior size. I originally purchased this pillow over 20 years ago because of a car crash. I am as happy with the second pillow as the first. It is great! The service was fast and reputable. I would order from this company again. Love this pillow! I have neck injury from car accident and this is only pillow that helps prevent headaches. My only complaint is that this pillow does not last as long as it used to. When I first purchased this pillow years ago I used 1-2 a year, now I have to replace the pillow every 1-2 months. these pillow i must have, the only one that works with my neck issues. but i have noticed that they just dont hold up like they used to. in the past a this pillow would last me a year, now im lucky if i get four months before my neck starts hurting. your prices are great but the shiping is just to expensive. My Husband uses the pillow, he loves it, this is his second one, I am glad I found it for him. I have gotten this pillow before (this is the third or fourth pillow) and been very happy with them. Unfortunately they changed the foam to a firmer type and I find this version very uncomfortable. I should have bought the ultra, which looks like is more like the original version of the regular. I am very happy with the service from Healthykin and will order from them again. I purchased this pillow for my husband. He is big and tall and now he doesnt have to use an extra pillow to get the support for his neck that he needs. Will be ordering again in the near future. I purchased this to replace a 15 year-old of the same model, which I liked very much. So far I am very disappointed, as this new pillow is much too firm and very uncomfortable. This is much firmer than the one I had before. One month later I'm still adjusting.